Hamilton drew level with Juan Manuel Fangio on five championships by securing the 2018 crown on Sunday in Mexico. The Mercedes driver pulled clear of Vettel in the last few races, having been neck-and-neck with the German through the first half of the season. “Through the year there were a lot of testing times for us,” Hamilton said when asked by Motorsport.com about overcoming Vettel and Ferrari. “Even on weekends where we didn’t have the package and we were on the back foot, we’d come away with wins even though we weren’t the quickest. “It took some special laps, it took some special moments in the car and I honestly could just re-live those moments all the time. Hamilton has salvaged victories, or at least strong results, from difficult situations this season. He charged through to second after being spun round by Kimi Raikkonen at the start in Britain, took advantage of rain to win from 14th in Germany (as Vettel crashed from the lead) and produced sensational qualifying laps in Hungary and Singapore to win on two of Mercedes’ weakest tracks. Hamilton said his “flawless” team deserved credit for making such performances possible. “I feel like I can drive anything and I feel I can take the car to places that nobody else can,” he said. 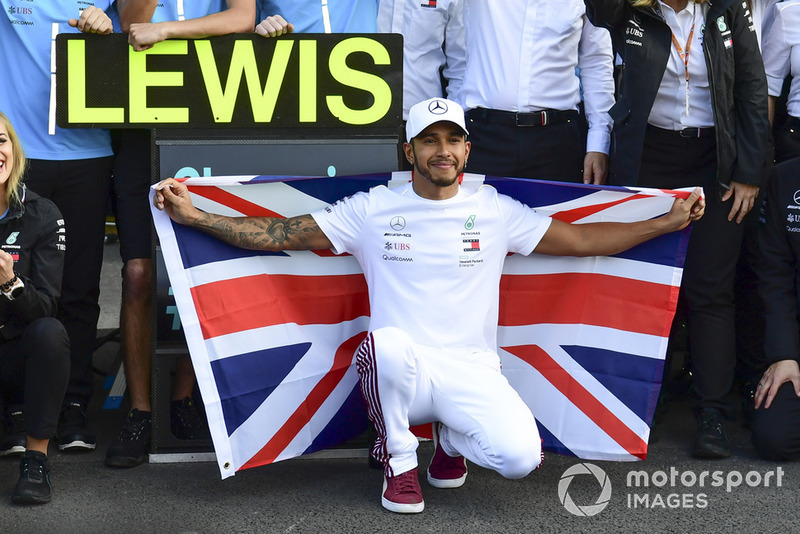 Hamilton credited his Silverstone fightback as a confidence-booster but said it was also valuable to have stolen victory from Ferrari in Germany and then again in Italy. Raikkonen and Vettel locked out the front row for Ferrari’s home race but Hamilton passed Vettel on the opening lap – as his rival hit him and spun to the back – and then hunted down Raikkonen to win. He also said winning in Hungary, where Ferrari was faster, just before the summer break was “more a confidence blow to the other team”. It means Hamilton, despite the increased challenge from Vettel and Ferrari, has already matched his tally of nine wins from last year and has two more podiums, with two races still to do. “There is no secret formula but somehow I managed to find that balance and that flow and I’ve had some of my best races of my career. Hamilton used his world title celebrations to pay tribute to his late grandfather, who died ahead of the Mexican Grand Prix weekend. He revealed after the race that his paternal grandfather, Davidson Augustine Hamilton, had passed away last Thursday. In a video released by Mercedes to capture Hamilton’s emotions after winning the title, an emotional Hamilton added: “Today is such a strange day. I’m just looking up and thinking about my grandad. “I really, really want to just do him proud and make my dad proud, because this is a difficult time for all the family.